May 10, 2016, 9:58 PM · When you make your professional solo debut in elementary school, how exactly do you balance growing up with a professional life? How do you build a career without compromising your education, wellness, and control over your own future? You might say that violinist William Hagen, 23, is in the midst of such a transition. Hagen made his debut with the Utah Symphony at age nine and more recently won third prize in the 2015 Queen Elisabeth International Music Competition. At age 10 he starting commuting from Utah to Los Angeles to study with Robert Lipsett at the Colburn Community School of Performing Arts in Los Angeles, then studied with Itzhak Perlman at the Juilliard School for two years. He has played with a long list of well-known conductors and orchestras around the world, and these days he juggles a busy schedule of solo engagements as well as his studies at the Colburn School, where he returned in 2012 to study with Lipsett. On a recent Sunday in April, Hagen played the Tchaikovsky Concerto with the West Los Angeles Symphony Orchestra to a robust audience at UCLA's Royce Hall. Playing on a c. 1675 Andrea Guarneri violin, his energetic presence and buoyant sound had audience members leaping to their feet to applaud after just the first movement. The other two movements brimmed with intensity, as well as an impressive range of musical color. His performance was well-received. But the performance is not the hard part for someone as accomplished and inclined toward the violin as Hagen. The hard part is building those successful performances into a career. "It's not the performance, it's everything after," Hagen said. "It's when you get off stage, it's getting the re-invite." A young artist can have a wildly successful performance, with a great review, positive comments from the conductor, satisfaction on all sides. But that doesn't mean he or she will be invited to perform again. "You don't go back without a call; you don't go back without somebody getting in touch," Hagen said. "That's something I learned. I don't come from a family of professional musicians; I came in as kind of a novice, and so I was naive about what it takes to make a career work. There are plenty of opportunities that I think back to, that could have been built on, if I had somebody working for me." Fortunately for Hagen, he now manages his dual life as a student and performing artist through Colburn Artists, an in-house management program that the Colburn School created in 2012. It's a specialized branch of its Career Development Center, co-directed by Laura Liepins, 20-year veteran artist manager and former Vice President of Opus 3 Artists. The idea is to provide impartial representation to those elite students who already are touring professionally as soloists. "Classical music is one of the only industries where some students are managing high-profile careers while still trying to finish school, but agents have a financial incentive to book many dates, even though the artist might not be able to handle the concert load," said Colburn publicist Lillian Matchett. "The program helps ensure students can perform and make a name for themselves, while also succeeding in school." The University of Michigan School of Music, Theatre and Dance's EXCEL Program, which offers entrepreneurship training and career services. Eastman School of Music promotes career development through its Institute for Music Leadership. Since 2010 the New England Conservatory has had its Entrepreneurial Musicianship program, to teach musicians to "be their own business." The Manhattan School of Music has a Center for Music Entrepreneurship that focuses on career coaching. In 2015, The Juilliard School received a large grant to create the Alan D. Marks Center for Career Services and Entrepreneurship to expand its offerings in career services. Less of a big name is DePauw School of Music in Greencastle, Ind., which nonetheless is a leader in the field of entrepreneurship, with its 21st-Century Musician initiative, which involves an online magazine called 21CM.org about music and entrepreneurship. "Most conservatories have added some kind of (business) course, and we have that here, too; it's called the 'Working Musician,'" said Liepins, who runs Colburn's Career Development Center as well as the artist management program. "What is different is that it's a requirement to graduate. It's not just for those who seek it out." Colburn students are required to take three classes related to life and career: Healthy Musician, Teaching Musician and Working Musician. "We make sure everyone gets exposed to it," Liepins said. "Our goal is to expose them to things that they're not even aware of and cover as many as topics as we can so they can find a way to delve deeper into something if they have an interest." The idea to create Colburn Artists came from an eye-opening incident: "There was an example of a very young student, age 12 or so, who was approached after a concert here at Colburn by a professional and offered management," Liepins said. That student was offered a six-year contract, with the promise "I'll make your career happen." "The parents signed it and were locked into something for six years that may or may not have been the best situation for their child," Liepins said. "Sel Kardan, the president of Colburn, saw this and realized that there's a great need for us to care for these exceptional students in this way." "It's a period in young artists' lives that can be very treacherous, whether you are 14, 19, or 23: making that transition from being a student to being a professional," Liepins said. "For some of these young artists, they are actually students and professionals at the same time, and that's a tricky tight rope to walk. You can't expect your violin teacher to have all the answers, to teach you the ropes of the business when you really need all that time focus on the instrument itself. Most students who are in this echelon receive extra time from their teachers, just preparing for concerts, learning the repertoire. So hiring a staff person hired to address the business aspect for the student was a smart move for the institution." Not every student at Colburn receives this extra level of career management; in fact, only a handful are eligible. "This program is for the very select few who are already playing professionally or who have been recognized outside of the school on a professional, industry level," Liepins said, for example, if the student has won an international competition. "It's representative of what happens in the real world; those with successful careers as soloists are really the top one to two percent of all musicians." Of Colburn Conservatory's 120 students, Liepins currently provides management to three students: Hagen; violinist Blake Pouliot; and pianist Ray Ushikubo. Graduates of the program include violinist Simone Porter; the Calidore String Quartet; and violinist Nigel Armstrong. Students also need to be recommended by faculty; and that faculty participation and buy-in is crucial in making the in-house management program function. "It's not an easy thing to do, to navigate with faculty and students. For it to be successful, it takes a lot of understanding between all parties. We're a trio, we're a team, because I really need the faculty's input," Liepins said. "If an engagement comes, I need to be able to ask, is this young artist ready to play this particular repertoire? Will they be playing it by this time? Have they already played it? Does it make sense to work this repertoire into their stable now? Or wait and try to arrange the engagement for different repertoire? It's a huge piece of it. You can go out and play the wrong piece, and it's difficult to recover from that. Or play something when you're not ready." "We've set it up here at Colburn where there's no financial interest. So that for anything that a young artist is paid for, there's no commission being paid to the school," Liepins said. "Our motive is in supporting this young artist for their best interests. Any professional, and I've been a professional in this for 20 years as an agent at Opus 3 Artists, will tell you that they have their best interests at heart, and they do. But they are also a business entity and they have a bottom line they have to meet." For students, that means they don't have pressure to accept engagements for financial reasons. "My role here is as a big picture guide. An agent or a booker will just book the gig and say, here take it. I'm here overseeing and working with the teacher, evaluating whether we want to do this for the long haul, what is best now, whether it's to take two months off and learn the Tchaikovsky Concerto, or take these two little recitals now." For William Hagen, Liepins "has kind of a dual role for me, in teaching me how to do things, and also doing everything that a manager does," he said. Colburn Artists Director Laura Liepins and violinist William Hagen. Photo by Violinist.com. "As capable as you think you are, you can't just go and do it on your own," Hagen said. "For me, one of the most useful things is just learning the ins and outs of the actual business side of it." Working with a manager is a skill in itself. "There is a learning curve, when it comes to working with a business professional who is advocating on your behalf, and that's part of the beauty of this program," Liepins said. "I am positioning them to be noticed, so I work with them on creating a profile that is professional. That includes things like having a professional photo shoot done, and creating a website if they don't already have one -- or bringing it up to a more professional standard." In Hagen's case, "right now we are in the phase of making these introductions. We just launched a brand-new website for Will," Liepins said. "He's playing for people and he's being invited. And as that starts to build, that's how we start to get noticed. That's the whole idea." But it's a team effort, and the artist must be an active part of that team. "Ultimately, any young artist who wants a successful solo career has to do the work themselves," Liepins said. "It does help to have an advocate. There are things that a manager will do and needs to do. But a young artist, or even a well-established artist, is always in charge of creating their relationships with the presenters and the conductors. They're hiring the artist, not the manager. No matter who's your manager, it's your relationship with that particular orchestra and that particular conductor that counts. If you're relying on your manager to create those relationships, that's not a good strategy. You can't sit around and wait for the phone to ring. That's what I try to impress on young artists; if you want it you've got to go out and get it." Penultimate scrutiny: who might win the First Prize at the Queen Elisabeth? 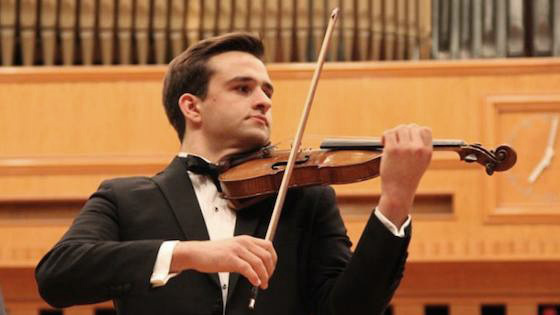 BELOW: William Hagen plays the Tchaikovsky Violin Concerto in the Finals of the 2015 Queen Elisabeth International Violin Competition in Brussels. Recorded live with conductor Marin Alsop with the National Orchestra of Belgium. May 11, 2016 at 07:21 AM · What also needs to be addressed is the fact that, at the moment, basically every top notch soloist seems to follow one basic path. I have found that I am able to predict most of how their web-page biography will go in the description of the formative years without reading They are pretty much all prodigies, playing either violin, cello, or piano ( occasional other token instrument sprinkled in), attending the same cluster of institutions, studying with the same teachers, and funneled by society into circulating the same warhorse, ticket selling repertoire around the world, with precious few moments for other musical projects. The current system discourages late-bloomers and late starters who might reach the same level of proficiency later in life, and encourages prodigies, who are under a lot of pressure, to keep repeating tradition, and sacrificing individuality without any critical assessment, or adding anything fresh to the mix. It might be part of what is contributing to the impression that classical music is dying. May 11, 2016 at 11:54 AM · There may be many reasons why it is easier for prodigies to reach a professional level compared to late starters. It could be "the system" as Lieschen suggests, but there are also differences in the biology and chemistry of the brain between younger and older people. Certainly there will always be exceptions. But in addition, children generally have the advantage of a low-responsibility, expenses-paid lifestyle. How many grown-up trust-fund babies are there who want to take up classical violin? If the odds (0.01%?) are the same for them as they are for children, my guess is that you will not see it happen very often. As for sacrificing individuality, the burden of having to play a tired old warhorse like the Beethoven Violin Concerto with an orchestra such as the New York Philharmonic is a cross that I believe many violinists would gladly bear. Josh Bell could probably retire if he wanted to. I believe Gershwin's phrase "nice work if you can get it" applies. And Hagen sure does play beautifully. May 11, 2016 at 09:24 PM · I am thrilled to hear that DePauw is getting recognition for their 21CM program. I graduated there in 2010, and while an excellent school, nowhere near as recognizable as Julliard or Eastman. Way to go DPU! May 12, 2016 at 02:20 PM · "The current system discourages late-bloomers and late starters who might reach the same level of proficiency later in life..."
Yes, but the operative word here is "might." They seldom do. It's like arguing that young athletes like ski racers or gymnasts are unfairly promoted by "the system." These are not endeavors for late-bloomers. Besides, many talented young musicians don't just stay in the performance merry go-round. It depends on their imagination. May 13, 2016 at 07:43 PM · Talent appears to be plentiful and cheap. A repeat invitation for one performer means no invitation for another performer. Unless we expand the market for talent we can expect that the young prodigies will have a few years of one-off engagements before they join an orchestra or a faculty or change careers. May 15, 2016 at 03:19 PM · I think career development centers are a great and much-needed part of musical training. But it's rather misleading to focus on and to call these particular services, aimed at and useful to only a very small cadre of young musicians, training for a "career in music," as if this is representative. The vast majority of students who are headed for a career in music will need the other courses and services that are given only a cursory bullet-point treatment here. May 15, 2016 at 10:29 PM · Colburn has taken a unique approach and has ideas that are worth hearing about. Different music schools and conservatories have different students with different needs. I hope this article fosters some thinking and conversation about the issue of offering a high level of career help to students . I invite people to follow the links provided in the bullet points, and I look forward to opportunities to write about other programs that are doing effective and innovative work.